This page provides an overview for the diagnosis and evaluation of conductive hearing loss. For hearing loss in general, see this page. 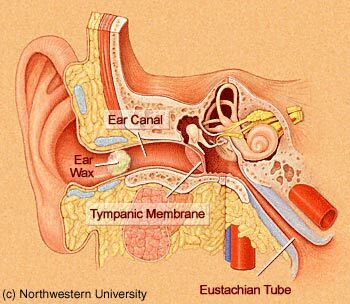 The outer ear consists of the auricle (unlabelled), the external auditory canal, and the lateral surface of the tympanic membrane (TM). 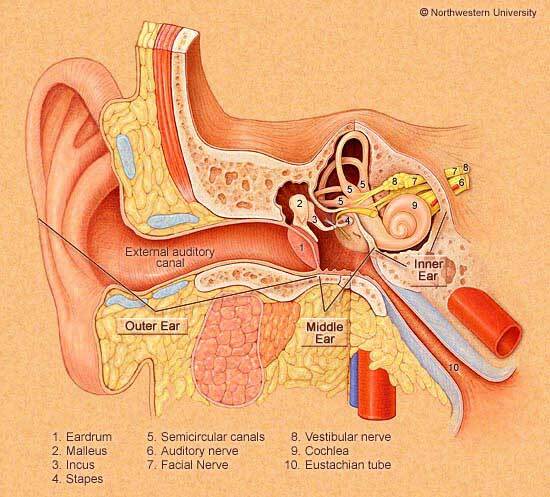 The middle ear includes the medial surface of the eardrum, the ossicular chain of bones, the eustachian tube. In conductive hearing loss, the second most common form of hearing loss after sensorineural hearing loss, sound is not transmitted into inner ear. Diagnosis of conductive hearing loss. Diagnosis is ordinarily made via observation of an "air-bone gap" on audiometry, meaning that hearing is superior when sound is transmitted in such a way that it bypasses the middle ear ossicular chain. The air-bone gap (ABG) should be at least 10 db. This audiogram is due to tympanosclerosis (see below). The Carhart notch, an audiological finding mainly of historical importance, is a dip at 2000 hz in bone conduction without a corresponding dip in air conduction. 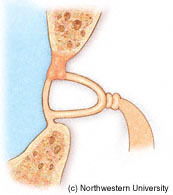 The Carhart notch is often found in persons with conductive hearing loss, including "glue ear" (Kumar et al, 2003). It is not useful as a predictor of otosclerosis (Kashio et al, 2011). There are several other audiological tests that are also commonly abnormal in persons with conductive hearing loss. These tests can be used to decide if the conductive hearing loss is "real". Tympanometry usually is either flat (as shown below), or shows an abnormally large volume (indicating a perforation). VEMP testing is usually absent on the side of conductive hearing loss. This is shown on VEMP below on the left side. The main exception to this general rule is the "pseudo" conductive hearing loss found in Superior Canal Dehiscence. More about this is below. Other tests that may be helpful in confirming conductive hearing loss are OAE testing and temporal bone CT scan. Cone-beam CT scan can provide equivalent diagnostic information as temporal bone CT, but with 4 times lower radiation (Debeaupte et al, 2018). However, cone beam is generally not available outside of dental offices. The mixed hearing loss pattern is defined by air conduction being worse than bone by at least 10 db (the conductive criterian) as well as bone conduction being outside of normal limits. Causes of conductive hearing loss. Causes include a buildup of ear wax, a foreign body in the ear canal, otosclerosis, tympanosclerosis (as shown above), superior canal dehiscence (which can also cause a conductive hyperacusis), external or middle ear infections (otitis externa or media), allergy with serous otitis media (fluid in middle ear), trauma to the ossicular chain such as temporal bone fracture, tumors of the middle ear such as a glomus tumor, erosion of the ossicular chain (cholesteatoma) and perforation of the tympanic membrane. If access to the ear drum is blocked, a conductive hearing loss is the result. This can be easily seen by someone who can look in the ear, generally with an otoscope. Ear wax is dealt with in more detail here. Case Example: A 12 year old boy put a "bug" in his ear several months ago. He complained to his mother that it never came out. On inspection of the ear drum, a small insect was seen stuck to the ear drum. Osteomas are bony growths that are encountered most commonly in cold-water swimmers. Usually no treatment is needed for these. External Otitis -- this is a painful outer ear infection. This is dealt with in more detail here. Treatment often requires antibiotics. 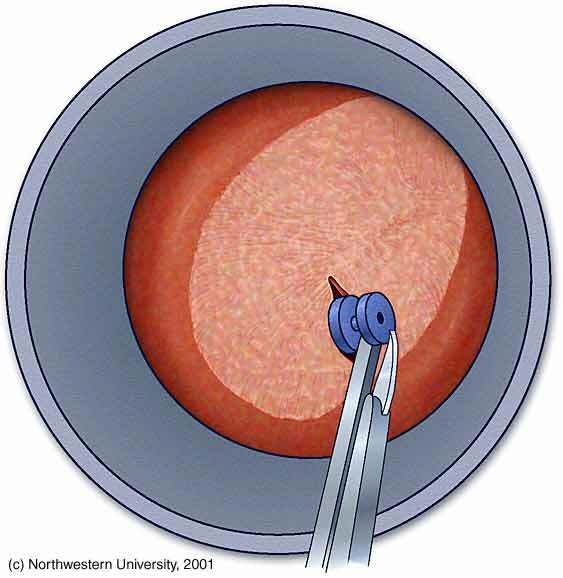 Tube insertion causes a slight conductive hearing loss. A hole in the ear drum, which is called a tympanic membrane perforation, causes a conductive hearing loss. It is more accurate to say that there is a hearing reduction, as generally hearing is not greatly affected -- a 10 db drop is typical. Tympanosclerosis is another cause of a minor conductive hearing loss. The audiogram at the top of this page is from a patient with tympanosclerosis. On ototoscopy, tympanosclerosis looks like a white patch on the ear drum. It is generally attributed to previous ear infections or trauma (such as a tube insertion). There also seems to be a weak association with increased serum calcium (de Carvalho et al, 2006) . It is presently thought that persons taking calcium supplements are not at increased risk, and also that there is no risk from calcium channel blocker medications. References: de Carvalho Leal, M., R. Ferreira Bento, S. da Silva Caldas Neto, et al. (2006). "Influence of hypercalcemia in the formation of tympanosclerosis in rats." Otol Neurotol 27(1): 27-32. The last step in the chain of signal transmission between sound in the air and movement of fluid in the inner ear is the middle ear. The middle ear, bounded by the eardrum (1) and the bony labyrinth, provides an additional 20-30 Db of mechanical amplification by coupling the large eardrum (tympanic membrane) to the oval window into the fluid filled inner ear. The 20 to 30 db of amplification is approximately the difference in sound intensity between a whisper and normal conversation. Otitis media: This is very common. Fluid buildup in the middle ear generally is organized under the term otitis media. This is dealt with in more detail here. In general, the treatment is to get rid of the fluid. Tumors can affect the middle ear. They are very rare. The most common ones are cholesteatoma associated with chronic ear infection (it is not a true tumor) and glomus tumors. These are dealt with in more detail elsewhere. There are three small bones interposed between the large ear drum, and the small hole (oval window) across which sound is transmitted into the inner ear. When these bones are fused (otosclerosis, or ossicular fixation) or broken (ossicular chain discontinuity), a conductive hearing loss is the inevitable result. In superior canal dehiscence syndrome, conductive hearing is better than normal. When combined with a sensorineural hearing loss, this pattern may look superficially like a conductive hearing loss, because there is an air-bone gap. The treatment of SCD may eliminate the air-bone gap. Practically, this is a very uncommon situation, of much more interest to diagnosticians than patients. In the "Large Vestibular Aqueduct syndrome" there is enlargement of the endolymphatic duct that connects the endolymphatic compartment to the endolymphatic sac (which lies just under the dura of the posterior fossa, ES above). Persons with LVAS may develop hearing loss as well as be unusually vulnerable to inner ear disease associated with head injury. Merchant et al (2007) have reported that conductive loss is common in LVAS, and that it has a mechanism similar to the conductive loss in SCD (see above). Characteristically, hearing aids work well for conductive hearing loss, and very good hearing results can be obtained. Surgical treatment is also generally available for conductive hearing loss as it is always due to a mechanical problem. Otosclerosis, in particular, has good surgical treatment. Most surgical treatments for otosclerosis or middle ear disease involve opening of the middle ear and repair under direct vision. Recently some groups (Kakehata et al, 2006) are using endoscopy for repair of ossicular chain disturbances -- in our opinion, this is still very investigational and somewhat unreasonable -- when working inside a tiny space, one needs as good an exposure as one can manage. However, in our opinion (which is not representative of general opinion of ear surgeons), we think it is preferable to use a hearing aid until hearing becomes unservicable, and then move onto an implanted hearing aid, and skip the middle ear surgery part altogether. Kakehata, S., K. Futai, A. Sasaki, et al. (2006). "Endoscopic transtympanic tympanoplasty in the treatment of conductive hearing loss: early results." Otol Neurotol 27(1): 14-9. Kashio A, Ito K, Kakigi A, Karino S, Iwasaki S, Sakamoto T, Yasui T, Suzuki M, Yamasoba T. Carhart Notch 2-kHz Bone Conduction Threshold Dip: A Nondefinitive Predictor of Stapes Fixation in Conductive Hearing Loss With Normal Tympanic Membrane. Arch Otolaryngol Head Neck Surg. 2011 Mar;137(3):236-40. Merchant SN, Nakajima HH, Halpin C, Nadol JB Jr, Lee DJ, Innis WP, Curtin H, Rosowski JJ. Clinical investigation and mechanism of air-bone gaps in large vestibular aqueduct syndrome..Ann Otol Rhinol Laryngol. 2007 Jul;116(7):532-41.